We are heading into the season of thunder and lightning storms; do you know what to do if you are caught outside in such a storm? We are lulled into believing we will never be a victim of a lightning strike, but your chance is not as remote as you might think. The Earth is struck by more than 100 lightning bolts every second (1); here in the US, there is o bea 1 in 3,000 chance for an individual to struck by lightning in the average lifetime. Most of us have been taught to lie flat on the ground or seek shelter under a tree. However, this is very bad advice. Why? Why not to lie prone on ground: Lightning is drawn to the earth because the air is charged and the ground is, well, grounded. The more of your body that touches the ground, the better your chance of being struck by a lightning bolt, and of having that charge pass through more of your body. Why not to seek shelter under a tree: Trees are a prime target of a lightning strike because of their size and their grounding in the earth. If you stand under a tree and the tree is struck, your body will also take the impact of the strike. 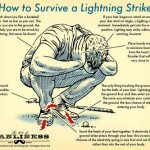 So, then, what should you do; how can you tell when a strike is imminent? You just have a bad feeling. Avoid touching electrical appliances, phones (land-lines) and plumbing, as lightening can travel through electrical and telephone wiring, and water in pipes. Don’t lie down: If you lie down, an electrical current passing through the ground from a nearby lightning strike can pass right through your body. Crouch low: Crouch low so you’re not the tallest object around, and at the same time keep your feet close together with your heels touching. This will help the electricity to go in one foot and out the other. Crouch as low to the ground as you can. Crouch on the balls of your feet: This way, a minimal surface of your body is touching the ground and, if a lightning strike does come through you off the ground, the current will most likely travel up one leg and down the other, missing vital organs like your heart. Cover your ears: Placing your hands over your ears can help minimize hearing loss from the forthcoming (loud) thunder boom. Beware of hair standing on end or skin tingling: These are signs that a lightning strike is imminent. 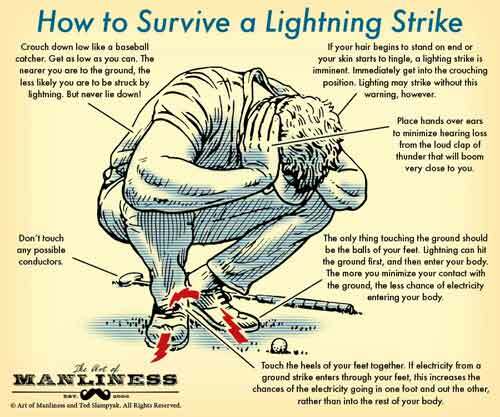 Get into the crouching position immediately if you feel them (but be aware that lightning may strike without these warnings). Because it carries a strong charge, lightning can do damage to your brain and nerves; It can also lead to cardiac arrest (heart attack) from the electrical shock. While serious burns are a possibility, they are far more rare. If someone near you was struck, it is safe to help that person (there is no risk of electrocution from toughing an affected person. Short-term problems include: muscle soreness, headache, nausea, upset stomach, confusion, mental slowness or fogginess, dizziness, and balance problems. Serious long-term problems can also result. See also related article on The EssentiaList: Plan for emergencies in high heat/bad weather. This entry was posted on Saturday, May 24th, 2014 at 11:30 am and is filed under Emergency Preparedness. You can follow any responses to this entry through the RSS 2.0 feed. Both comments and pings are currently closed.